Researchers at the U.S. Department of Energy’s Ames Laboratory, Iowa State University, and the University of Crete in Greece have found a new way to switch magnetism that is at least 1000 times faster than currently used in magnetic memory technologies. Magnetic switching is used to encode information in hard drives, magnetic random access memory and other computing devices. The discovery, reported in the April 4 issue of Nature, potentially opens the door to terahertz (1012 hertz) and faster memory speeds. Ames Laboratory physicist Jigang Wang and his team used short laser pulses to create ultra-fast changes in the magnetic structure, within quadrillionths of a second (femtosecond, or 10-15 sec. ), from anti-ferromagnetic to ferromagnetic ordering in colossal magnetoresistive materials, which are promising for use in next-generation memory and logic devices. Scientists at the University of Crete, led by Ilias E. Perakis, developed the theory to explain the observation. “The challenge facing magnetic writing, reading, storing and computing is speed, and we showed that we can meet the challenge to make the magnetic switches think ultra-fast in the femtosecond range by using quantum ‘tricks’ with ultrashort laser pulses,” said Wang, who is also an assistant professor of physics and astronomy at Iowa State University. In current magnetic storage and magneto-optical recording technology, magnetic field or continuous laser light is used. For example, photo-excitation causes atoms in ferromagnetic materials to heat up and vibrate, and the vibration, with the help of a magnetic field, causes magnetic flips. The flips are part of the process used to encode information. So, some scientists have turned their attention to colossal magnetoresistive (CMR) materials because they are highly responsive to the external magnetic fields used to write data into memory, but do not require heat to trigger magnetic switching. Wang’s team specializes in using ultra-fast spectroscopy, which Wang likens to high-speed strobe photography, because both use an external pump of energy to trigger a quick snapshot that can be then re-played afterwards. 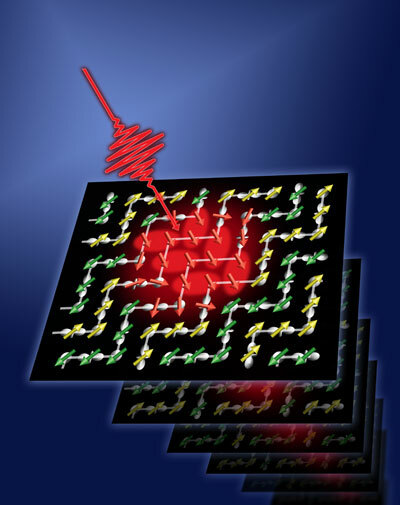 In ultra-fast laser spectroscopy, a short pulse of laser light is used to excite a material and trigger a measurement all on the order of femtoseconds. The fast switching speed and huge magnetization that Wang observed meet both requirements for applying CMR materials in ultra-fast, terahertz magnetic memory and logic devices.